Earn $4.59 in Rewards credit. Click to learn more. 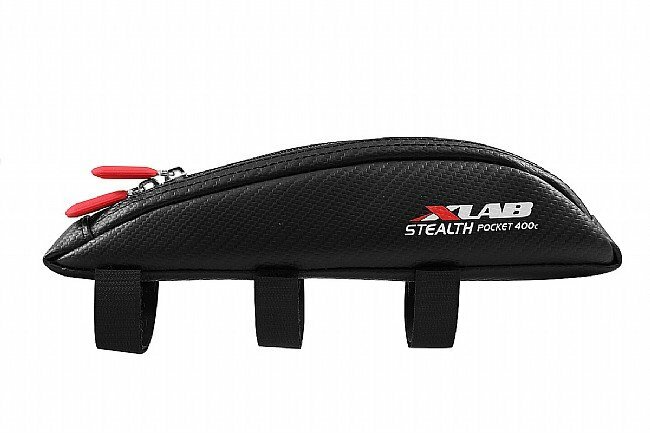 The Xlab-USA Stealth Pocket 400c is a sleek, element-deflecting material withstands wear, perspiration, and electrolyte drinks. 10.5" L x 2.1" H x 1.5" W.
Universal, top tube strap mounted storage. Optimized for bikes with angled stems or cables extruding from top tube. Stay stocked for the ride: Storage comfortably fits up to 6 gels. Stays put – does not rock or sway. Rubberized bottom and structured sides keep pouch aero and in place.